This collection of 86 films is a map for navigating the 21st century. It is guided by the premise that we are facing a planetary emergency, and the primary role of schools today should be to prepare students to become active participants in designing the transition to a just and sustainable world. Most colleges prepare students to read a map of the world that's both outdated and distorted. From economics to history to politics to ecology, modern schools are failing to prepare students for the future on a fundamental level. To put it simply, most colleges are still running on a set of assumptions that were developed during the 20th century. These assumptions are largely invisible to us - they are part of our subconscious "story of humanity" - but they ultimately constitute the heart of our societal crisis. The most simple of these is the premise that things will go on as they have before - that we can just get a job, do our part to grow the economy (progress!) and go on our merry way. They are not guiding students with the knowledge and wisdom that we are facing a planetary emergency, with a time crunch measured in decades. 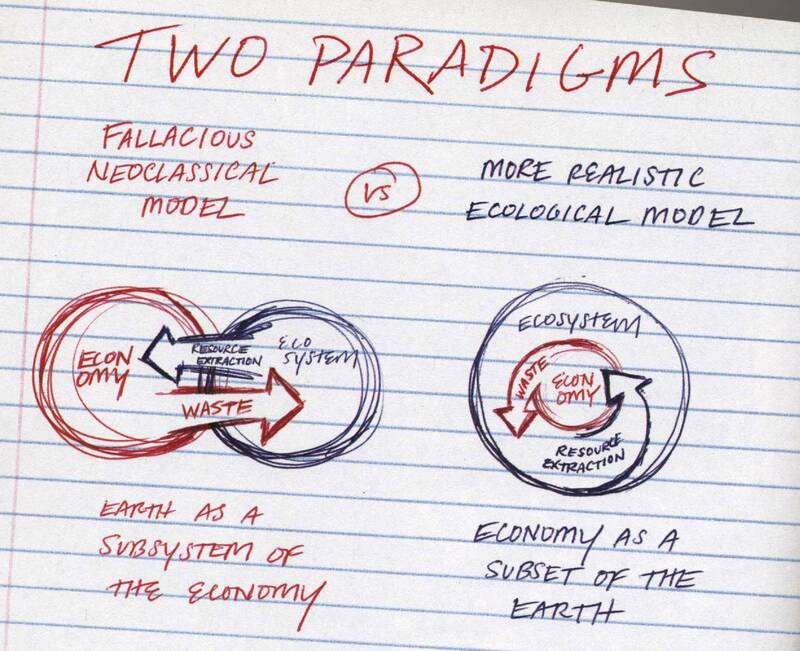 Most colleges still follow the logic of neoclassical economics - a logic which ignores ecology and suffers from the illusion that human law is separate from natural law. Nowhere is this belief better embodied than in the foolhardy notion that our economy can grow forever on a finite planet. But that is one of the implicit assumptions underlying a standard college education. They train students to become workers and consumers within an ever-growing economy. They teach marketers how to sell more products. They teach business students how to make a profit. They teach students lots of useful, fascinating and amazing things too, but ultimately the mission is to train students to integrate within the status quo. This might be fine if the status quo worked for all of us, but it never has and it's about to stop working for everybody if we don't soon make a change. Whether things change in a really positive direction or a really bad one is up to what we do over the next 10-30 years. But either way, we can be certain - the status quo isn't going to last, and presently, most schools can't bring themselves to admit this. Not yet in a very serious sense - not yet in a way that would disrupt many of their corporate investments or sponsors. What is needed, urgently, are schools that acknowledge the 'fierce urgency of now.' They need to be preparing us to become collaborative designers of an ecologically sustainable, just and democratic society. They need to help all of us become creative and participatory agents for this great societal transition, away from empire and into the planetary era. Education can no longer afford the pretense of neutrality when neutrality is leading society towards collapse - it must choose life. It must promote not just knowledge, but wisdom. Because that is what the world needs right now - it needs people with the wisdom to actively take part in designing a way of life for humans that is not just sustainable, but regenerative - a way of life that makes life good for life. Ultimately that is what ecology teaches us - life creates conditions that are good for life, and our own society, as past human societies have done, must align with this inherent wisdom. Align with this wisdom, and life for us will be better than we've ever dreamed it could be, and it will good for all life - because we had the wisdom to put our creativity and imagination to those ends. If we continue to disregard this natural law - enriching some to the detriment of many, both human and environment, then we will perish with the many millions of other life forms that will go down with us. While many despair and believe all is already lost, we know that is just a mental fantasy, a trap of the mind. The future has yet to be written. The present moment is everything there is. We believe the story of humanity - while on the verge of calamity, has a great plot twist coming, and it is already being written by millions of people all over the planet. But we still need millions more, every young person, every older person - we need us all, helping to write this story. We know cynicism is safe. Cynicism is easy. But we also know the courage of our ancestors lives in our bones, and we have the power to tap into that strength when our heart is willing to remain still and listen. With all this and more in mind, we have created this educational map for navigating the coming years. It's broken up into several core themes. We hope everyone, students and teachers especially, will find it useful. Explore Films For Action's complete library via the Explore menu. Films For Action University is currently comprised of 86 films. There are numerous films we would really like to add to it, but currently, they aren't available to watch online, either for free or to rent. As that changes, we'll be updating this resource over time. If you like it, please feel free to start sharing it widely. Over the years, we have heard so many wonderful stories about people telling their friends about this site, or about teachers telling their students, and how much they love it after spending some time watching a few films. Now that there are thousands of films on the site, the very best gems have become buried all across our library, so we realized we needed a more guided way to dive in. Films For Action University aims to be this entry point. It is our attempt to curate the kind of crash-course curriculum on the state of the world we wish we had all got growing up, but didn't. A resource gathered after watching over 800 films over the last 10 years. We hope you find it of value.